STRATFORD, Ont. — Once upon a time, Tyler Tardi and draw weight were not exactly on friendly terms. That’s not helpful, to say the least, for a skip. But things have changed over the past few years for the Team B.C. 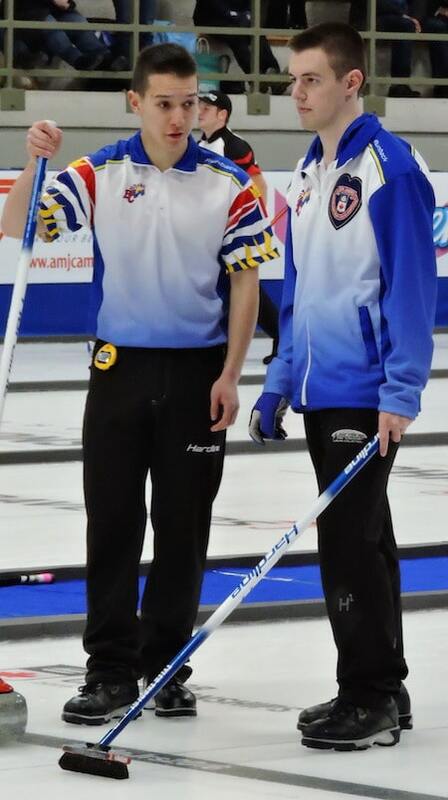 shot-caller, who improved to 4-0 at the 2016 Canadian Junior Curling Championship, presented by Egg Farmers of Ontario, on Sunday night with an 8-3 win over Northern Ontario’s Tanner Horgan (3-1; Copper Cliff) in an early battle of unbeatens at the Stratford Rotary Complex. Tardi, 17, credits his extensive mixed doubles experience — he’s a two-time B.C. champion with Dez Hawes (a member of the B.C. women’s team here) — for changing his mindset about throwing draws. “It definitely has made me a lot better at the touch game,” said Tardi, who made the playoffs at the 2015 mixed doubles nationals in Ottawa before being knocked out by four-time world champ Glenn Howard and his daughter Carly. “I used to only be able to throw hits and never make a draw if my life depended on it. But I’m definitely more comfortable with those touch shots. It’s paid off in the early going in Stratford as the young B.C. team from New Westminster and Langley — which includes third Daniel Wenzek, second Jordan Tardi (Tyler’s older brother) and lead Nick Meister — has been coolly making every shot en route to a perfect opening weekend. Tardi’s coach, and father, Paul Tardi said the mixed doubles discipline, which will be an Olympic medal sport in 2018, has made Tyler a better curler. “It does change his approach, for sure,” said Paul Tardi. “I’ve seen him get into those mixed doubles ends where there’s a lot of clustering, and you get used to seeing a lot of funny angles. And he’s able to think far enough ahead that he can get teams into an end where they don’t realize they’re in trouble, and you can’t get out of those ends. Also remaining unbeaten in men’s play was 2013 Canadian champ Matt Dunstone of Manitoba (Winnipeg), who improved to 3-0 with an 11-6 win over Greg Smith of Newfoundland/Labrador (0-2; St. John’s). In other Sunday night games, P.E.I.’s Matt MacLean (1-2; O’Leary) beat Matt Miller of the Northwest Territories (0-3; Inuvik); Alberta’s Karsten Sturmay (2-1; Edmonton) knocked off Nunavut’s Arthur Siksik (0-4; Rankin Inlet) 23-2; and Quebec’s Félix Asselin (2-0; Montreal) was a 9-6 winner over Ontario’s Doug Kee (2-2; Navan). In women’s action, Nova Scotia’s Mary Fay (Chester) picked up her fourth straight win, scoring two in the 10th end to beat Saskatchewan’s Kourtney Fesser (2-2; Saskatoon) 7-6; Manitoba’s Abby Ackland (2-0; Winnipeg) stole three in the eighth end for an 8-5 win over Quebec’s Laurie St-Georges (2-2; Laval-sur-le-Lac); Alberta’s Selena Sturmay (3-0; Airdrie) toppled Zoey Walsh of the Northwest Territories (0-2; Hay River) 12-2; New Brunswick’s Justine Comeau (2-1; Fredericton) came back from a 5-1 deficit to beat Nunavut’s Sadie Pinksen 0-4; Iqaluit) 14-5; and P.E.I.’s Katie Fullerton (1-2; Cornwall) hit the win column with a 9-4 win over Newfoundland/Labrador’s Brooke Godsland (0-3; St. John’s). Action at the 2016 Canadian Juniors continues Monday with draws at 9 a.m.; 1:30 p.m. and 6:30 p.m. (all times EST).